Qt Tutorial - Chapter 6: Building Blocks Galore! This example shows how to encapsulate two widgets into a new component and how easy it is to use many widgets. For the first time, we use a custom widget as a child widget. The LCDRange widget is a widget without any API. It just has a constructor. This sort of widget is not very useful, so we'll add some API later. This is lifted straight from the MyWidget constructor in Chapter 5. The only differences are that the button is left out and the class is renamed. MyWidget, too, contains no API except a constructor. The push button that used to be in what is now LCDRange has been separated so that we can have one "Quit" button and many LCDRange objects. We create a QGrid object with four columns. 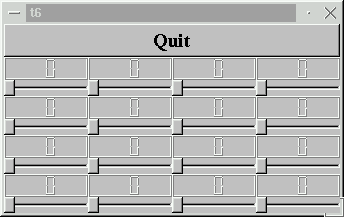 The QGRid widget automatically arranges its children in rows and columns; you can specify the number of rows or of columns, and QGrid will discover its new children and fit them into the grid. We create 4*4 LCDRanges, all of which are children of the grid object. The QGrid widget will arrange them. This program shows how easy it is to use many widgets at a time. Each one behaves like the slider and LCD number in the previous chapter. Again, the difference lies in the implementation. Initialize each slider with a different/random value on startup. The source contains three occurrences of "4". What happens if you change the one in the QGrid constructor call? What about the other two? Why is this? You're now ready for Chapter 7.